Wedding transportation is one of those little details that are only VERY important if you forget about it. You’re going to need a car/limo service to transport you from the ceremony venue to the reception venue, as well as to take you to the airport for your honeymoon. If you’ve got relatives visiting from out of town, you’ll need a way to transport them around town. If you’re looking for luxury and comfort, we at Red Scooter are proud to recommend Caddyman! Not only do you get a quality car service, but you are chauffeured around in vehicles like you’ll find nowhere else in Melbourne. What makes Caddyman stand out from all the rest is the fact that they ONLY bring antique Cadillac cars to your wedding. The Cadillacs are all from the late 50s and early 60s, making them vintage, absolutely gorgeous vehicles. If you want to break out of the mould and get away from the classic black limo, you’ll love the bright elegance of the Caddyman Cadillacs. The vehicles may be old, but they come with all the luxuries a modern couple could hope for. They’re supremely comfortable, with beautiful leather seats, an interior that looks as good as new and with a driver who is available to take you anywhere around town. 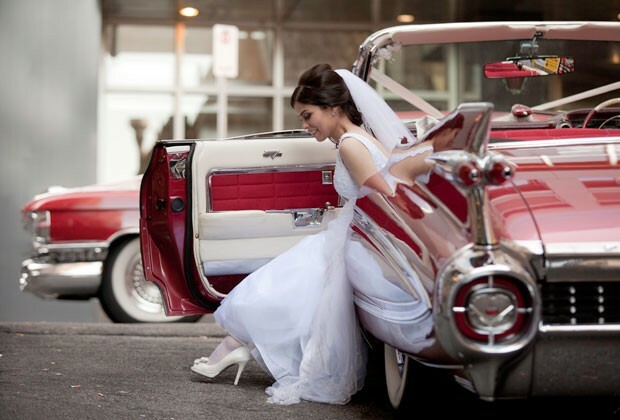 It’s a quality car service like no other in Melbourne, and it’s guaranteed to make you 100% unique from all the other couples who opt for the “traditional” wedding transportation. We have worked with Caddyman on a number of occasions, and they’ve never let us down. Not only do their bright, colourful vehicles match perfectly with our Red Scooter themes, but all of their drivers are supremely friendly, helpful people who are more than happy to help make your wedding day a dream event. They come highly recommended! “Very very happy with the service provided by Caddyman. The drive to the wedding was so wonderful and comfortable, I was very relaxed on my way to the wedding. Our driver was lovely, and had Levi’s music and other songs from the 50s/60s playing which just added to the experience. 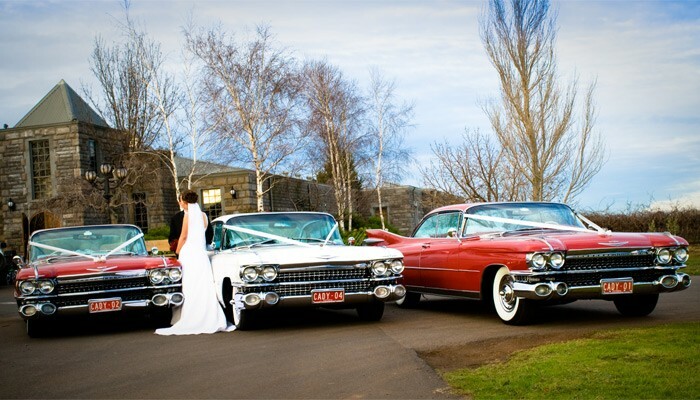 I would highly recommend choosing caddy man for you wedding you will not be disappointed.” — Nicole D.
“BEST CARS. BEST SERVICE. BEST PEOPLE. These gentleman were absolutely AMAZING, the cars speak for themselves, however the gentleman that drive these cars made my day so much sweeter. They bought snacks and shawls for the girls, they bought water and sandwiches and coffee.” — Moura K.
“I can’t begin to thank you for your amazing service. You guys made our wedding day so fun & joyful and the cars were simply beautiful. I’m so glad you were there with us on the day!” — Gulsen S.